She described her experience in a video interview published by the filmmaker Mike McGregor three years ago. 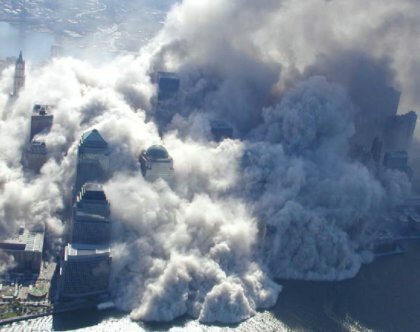 See 2 minute video https://vimeo.com/28767268 plus attached 29 minute World Trade Center best actual time 9/11 film footage I have ever seen. In the chaos that followed, Ms. Borders retreated to a crowded stairwell where she was chased by a cloud of smoke and dust. After surviving 9/11 Ms. Borders struggled with alcohol and drugs dependency, losing custody of her children. “I didn’t care about myself or anyone else. I couldn’t deal with life. I had become a garbage can. I dropped to around 90 lb. My life wasn’t getting any better. I wanted to end it,” she told The Times around the same time. Following a stint in rehabilitation in 2011 she remained sober. She was diagnosed with cancer in 2014 and started a course of treatment. Writing on Facebook, her cousin John Borders, said she “unfortunately succumbed to the disease that (have) ridden her body since 9/11…. In addition to losing so many friends, co-workers, and colleagues on and after that tragic day, the pains from yesteryear (have) found a way to resurface, he wrote. We have all been bamboozled by the great lie of 9/11 and it continues to this day,14 years later. Everyone has been infected by it; illegal wars have been justified, torture has been condoned and our moral values have plummeted as the great lie persists. Hitler perfected the great lie in the 1930's and his primary rules were: never allow the public to cool off; never admit a fault or wrong; never concede that there may be some good in your enemy; never leave room for alternatives; never accept blame; concentrate on one enemy at a time and blame him for everything that goes wrong; people will believe a big lie sooner than a little one; and if you repeat it frequently enough people will sooner or later believe it. 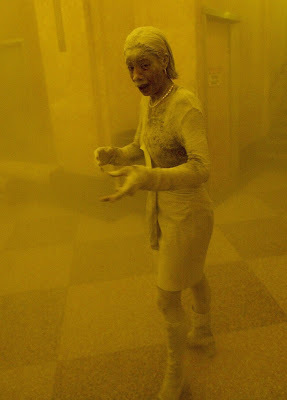 But the dust has not settled on 9/11 and it is the spirit of people like Marcy Borders, who refused to stay at her desk as instructed, and scrambled to safety from the North Tower on that fateful day in 2001 ~ that serve as a reminder that the truth of 9/11 will eventually emerge from the dust and that justice will triumph. 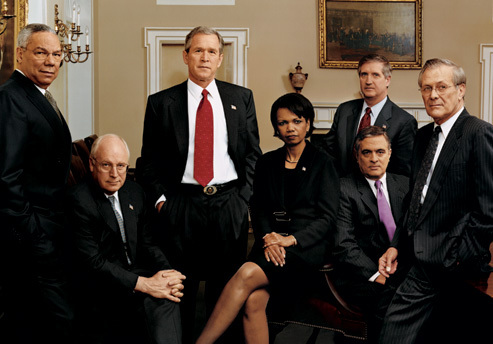 ◾Falsely linked Iraq with 9/11 (indeed, the entire torture program was aimed at establishing such a false linkage; and Cheney is the guy who pushed for torture, pressured the Justice Department lawyers to write memos saying torture was legal, and made the pitch to Congress justifying torture. The former director of the CIA said Cheney oversaw American torture policies.